From the scorched deserts of Africa to the frozen wastes of the Antarctic the forces of darkness are once more on the riser. From the chill fog-shrouded European cities to the sweltering tropics, from coast to coast and pole to pole, the creatures that haunt our nightmares are gathering strength. Against this growing threat the Rippers stand ready to do battle around the globe, and the future of mankind hangs in the balance. 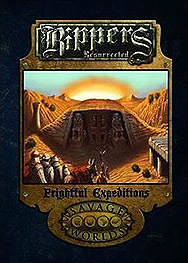 Frightful Expeditions gives the Rippers Resurrected Game Master a selection of exotic locales and nefarious plots to challenge Rippers wherever they may travel. Sections on Africa, Antarctica, Asia, Australia, Europe, North America, and South America, provide a host of all-new Savage Tales, deadly locations, and terrifying enemies. This book requires the Rippers Resurrected Game Master's Handbook and Player's Guide, and the Savage Worlds core rules to play.